Aki Maita from Bandai developed the first concept of the Tamagotchi assisted by Akihiro Yokoi. During fall of 1996 they gave away 200 devices to high school girls in Shibuya, Tokyo. After a few weeks and many surveys, the toy was released to the public. 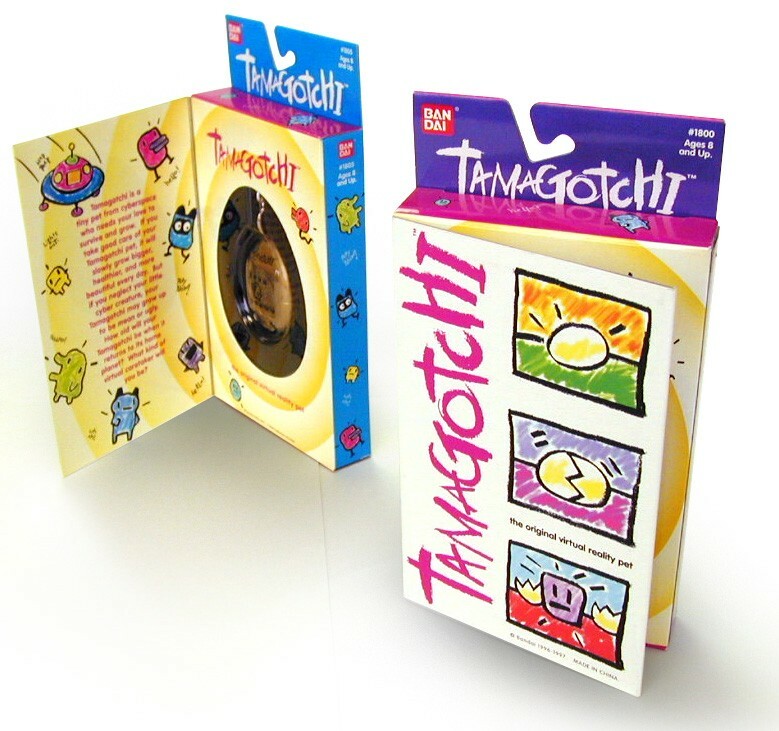 Tamagotchis hit the US about a year after with a branding and design by Bob Nenninger. Tamagotchi was a toy developed by Bandai Japan that had only been introduced into the Japanese market. It had become a huge hit there and they were looking to introduce this toy to the U.S. market. This was a completely new type of toy. A “virtual pet.” So the nature of the toy had to be communicated in some way. The only problem was that the packaging being used in Japan was very cluttered and confusing. What worked in Japan would not work in the U.S.
Tamagotchi was filled with characters that were spunky and edgy. Every time you played the toy, you would get a new character that would grow as you nourished it. Depending on how you did that, the character would grow into any number of characters. Some of them were sassy. Some were sweet. Some were sad. Happy. And so on. The toy was, in essence, a parenting toy. If you were a good and active parent, you got a happy character. If neglected, your character was problematic. It was hard to put it down once you started. Tamagotchi was different than any other toy. And the brand design had to say that.